This past week, I found myself wanting a bit of change (edit: major change) from all the takeout and elevated sodium I had been eating because of exams and really because I got lazy to cook. After exams, in a spontaneous state of sorts, a few friends and I decided to celebrate with baking and laughter and really good company. This was a real impromptu throw-on, the kind where you basically show up at a friend’s house with baking supplies, and they’re really too wonderful to turn you away. So, let’s celebrate with cake. And not just any cake–birthday cake. 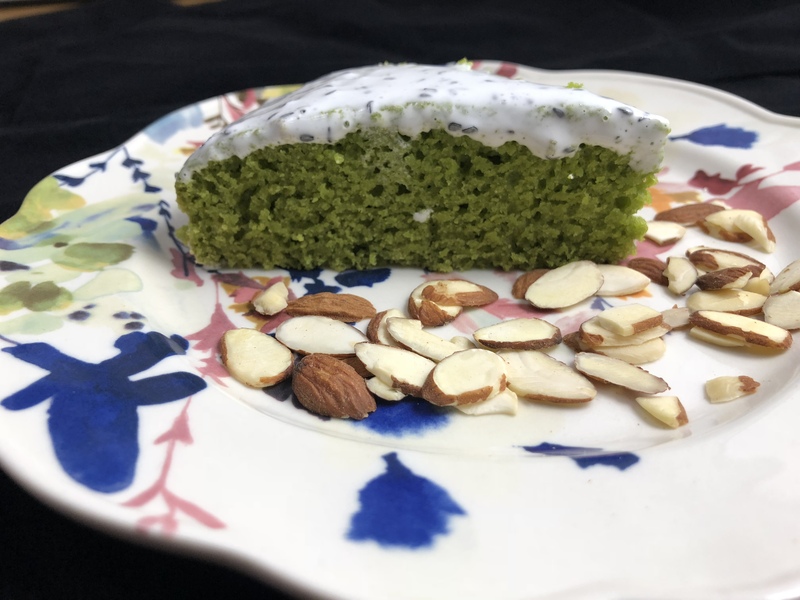 And friends, this isn’t just a birthday cake– it’s a matcha vegan cake. The matcha lends a popping bright green hue, which gracefully ushers in Spring. And, perhaps that’s foreshadowing because this cake has whipped bean water (aka aquafaba). Many times cake tends to be overly sweet, but this one is moderate in its sweetness and practical in its frosting. I’m not the biggest fan of thick layers of frosting since I usually end up scraping most of it off anyway and eating the sponge. Are you ready for cake?! Believe me, you can eat the dough straight out of the bowl. Cool the cake for 10 minutes on a wire rack and then loosen the edges by running a knife along the sides. Allow the cake to cool at room temperature for 30 minutes to 1 hour, or if short on time, stick it in the freezer covered loosely with plastic wrap for 15 minutes. Add the aquafaba to a mixing bowl, and then add oil and cream of tartar. Whip the aquafaba on medium to high speed until you see it foaming. Then slowly add the sugar one tablespoon at a time while whipping the aquafaba. Add both of the extracts. Then, add the toasted black sesame seeds. You cannot overwhip aquafaba, so it’s fine to increase the speed. You are aiming close to stiff peaks. Top the cake with the meringue, and if you’re feeling fancy, toast the meringue with a kitchen blow-torch or under the oven’s broiler for a few minutes until it’s slightly browned. Your frosting will turn our less running than the one pictured because you can avoid our mistakes (1) don’t dump the sesame seeds in while still warm (2) accidentally put in 2 tsp of almond extract (too much liquid). Honestly, it was still pretty delicious. Cut the cake with a large, sharp chef’s knife, and enjoy! Store leftovers, refrigerated airtight, for up to 3 days. Dharma is a beautiful bee in med school. She grew up in Chicago and is very interested in dramatic music.